This course introduces the Navigation Architecture Component, a new component from the Jetpack library family, that facilitates navigation within the different screens of an Android application. Navigation is a complex task that is usually overlooked by developers. 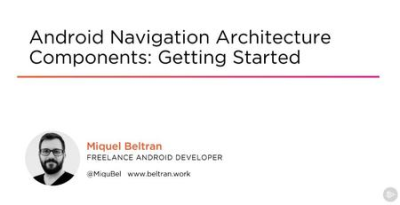 In this course, Android Navigation Architecture Components: Getting Started, you will learn foundational knowledge and gain the ability to implement navigation within the different screens of an Android application. First, you will learn how to use the new navigation graph. Next, you will discover different ways to perform navigation screen to screen in your apps. Finally, you will explore how to perform deep linking, navigating into your app from the outside. When you're finished with this course, you will have the skills and knowledge of Android navigation needed to implement complex Android applications.